Major cycling publications and organizations have consistently rated Montreal as one of the top bicycle-friendly cities in the world during the past decade. For good reason. 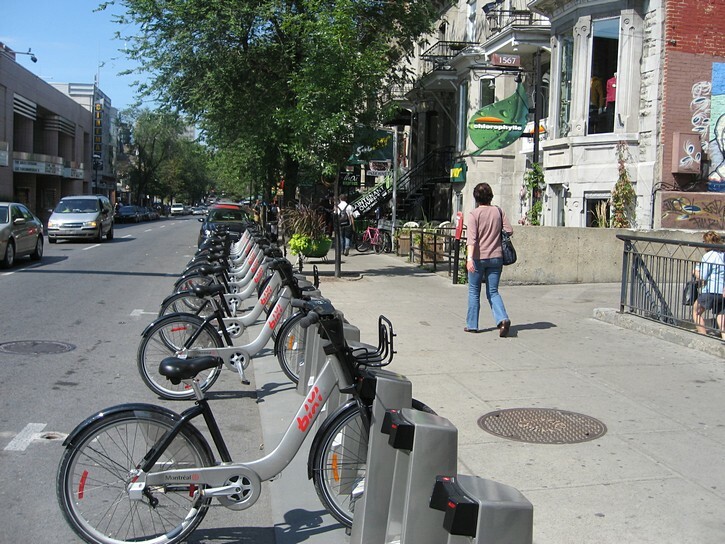 The creation of hundreds of kilometres of bicycle lanes, paths, and trails, and the establishment of the self-serve rental system with 5000 Bixi bikes, puts Montreal at the leading edge of what large cities can do to facilitate and promote cycling. 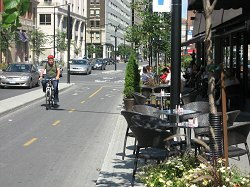 The amazing thing about all of this is that a little over 20 years ago Montreal had the opposite reputation, and it lagged far behind Ottawa and Toronto for being a bicycle-friendly city. It wasn’t long ago that Mount Royal Park was the best Montréal had to offer cyclists looking for an interesting place to ride. 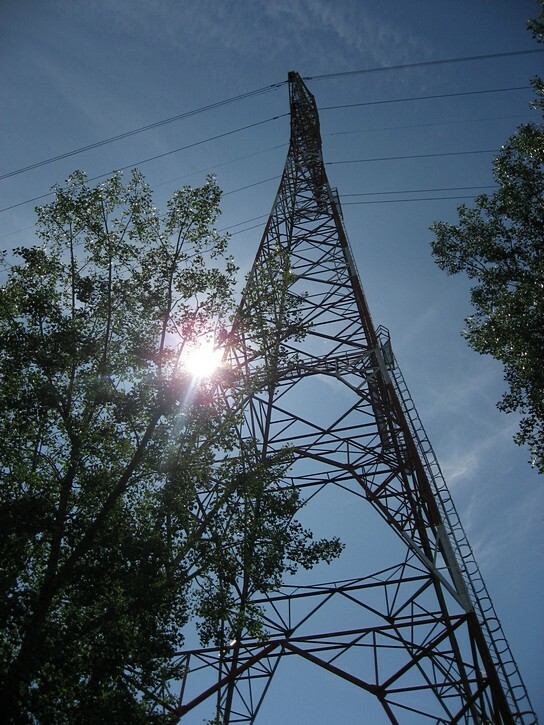 If you want to do some hill climbing, or get a fantastic view of Montreal’s downtown core, Mount Royal is still a great place to go cycling. However, the city now has so much more to offer. 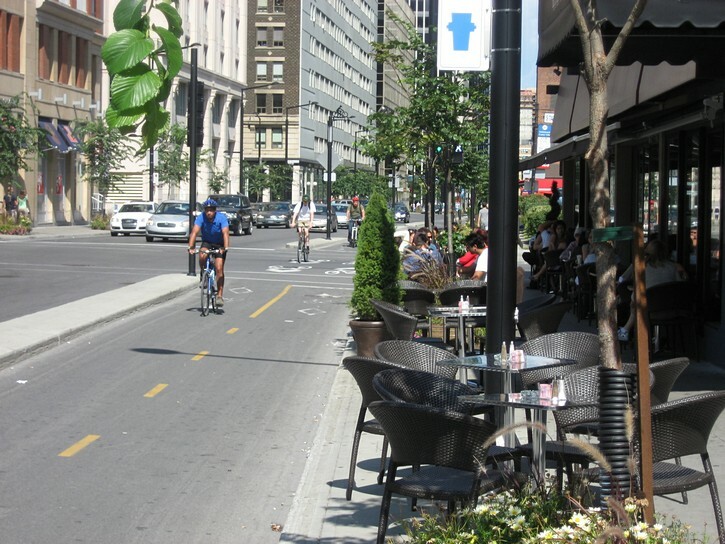 One example is the recently completed bicycle lane which transverses the entire length of Montreal’s downtown area. Here we are not talking about painting a white line and a few bicycle symbols on a narrow strip of pavement. This bike path takes up a whole car lane on De Maisonneuve Boulevard, and it is separated from the rest of the street with a substantial cement curb. There are also lots traffic signs to help ensure that cyclists can safely navigate through the busy downtown intersections. Moreover, Montreal is serious about keeping this bicycle facility open all year round. At one point motorists were actually complaining that the city was removing snow from the bicycle lane faster than the roads. What this all means is that if you go to Montreal for business or pleasure, be sure to bring your bike. Since it is only a two hour drive from Ottawa, getting to Montreal by car is a very short trip, and it provides an easy way to transport your bike. You can also go by Greyhound Bus and check in your bicycle as luggage (for an extra fee & the bike must be boxed). For an additional fee, it is now possible to check in a bicycle as luggage on a few of VIA passenger trains running between Ottawa and Montreal. In some cases, there is no need to box or partially disassemble the bike (consult the baggage policy to see what is allowable on each train). Needless to say, you could always ride your bike to Montreal. 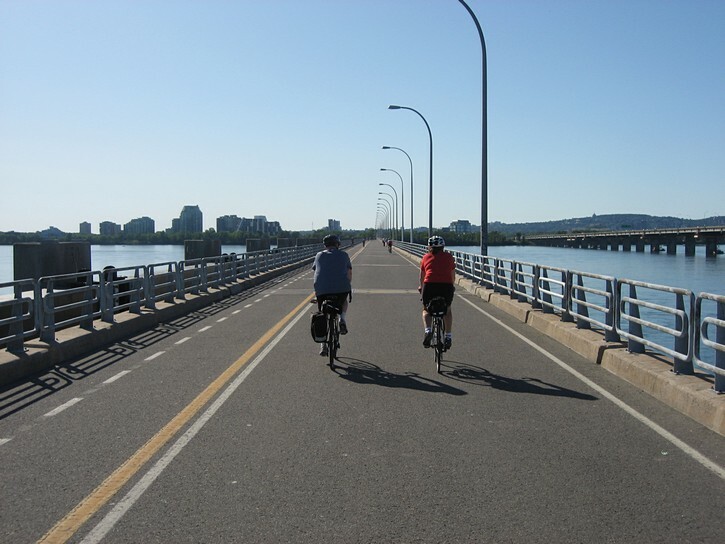 It is possible to cycle a good portion of the distance on the quiet roads which hug the shoreline of the Ottawa River on the Ontario side (you’ll probably want to cross the river at Hawkesbury). Although this route can be very scenic, there are long stretches where there are no paved shoulders. On the Quebec side of the river you could follow the “Route Verte” between Gatineau and Laval (a large suburb just north of Montreal). Here you will be riding on a paved shoulder almost the entire way along regional Highways 148 and 344. The only problem with this route is that it is not very pleasant to ride along those segments of the 148 that have lots of truck traffic. The volume of traffic on the 148 is expected to decrease sharply once Quebec finally completes Autoroute 50, a major four lane highway that is being built between Gatineau and Montreal. 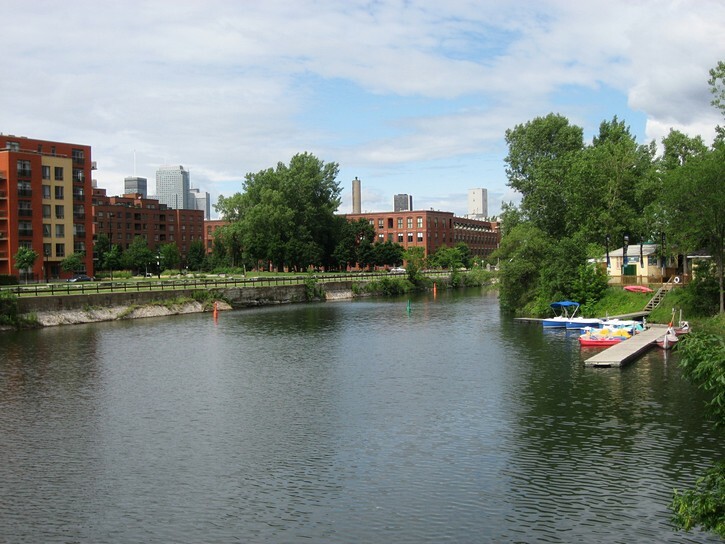 If you only have time for one ride in Montreal, you’ll probably want to cycle along the Lachine Canal. 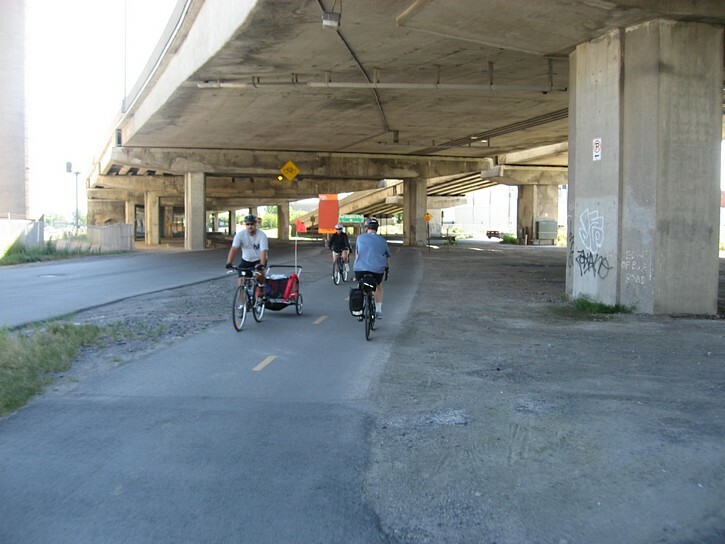 It is a fitting destination not only because it is a great ride, but because the creation of a park and bike path along the canal in the late 1970s marks the beginning of when Montreal started to transform itself into a world class bicycle-friendly city. 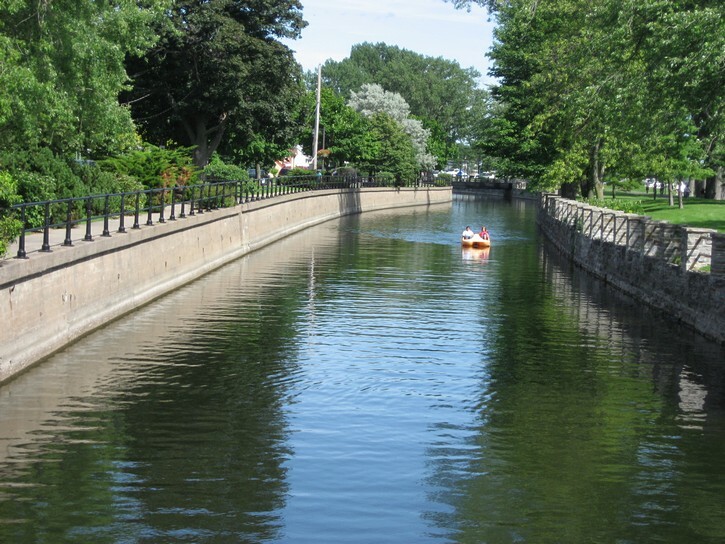 The canal is located about one kilometre south of the city’s downtown area, and runs in an east-west direction from Montreal’s Old Port to Lac Saint-Louis. 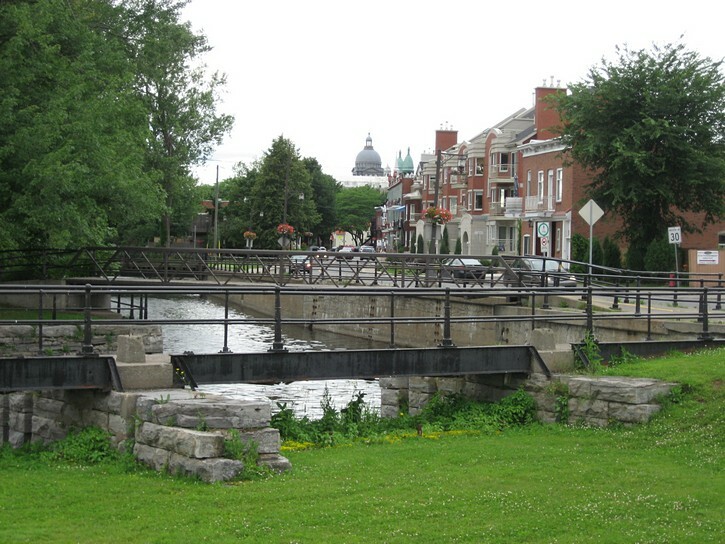 Completed in 1825, the Canal was built to allow ships to bypass the Lachine Rapids, and was the life blood of Montreal’s economy for many years. It closed in the late 1960s after ships started using the St-Lawrence Seaway, and for a number of years it was regarded as nothing more than a relic of Montreal’s industrial past. A multi-use path and park area were established along the canal in the late 1970s, and it was reopened for recreational boating in 2002. 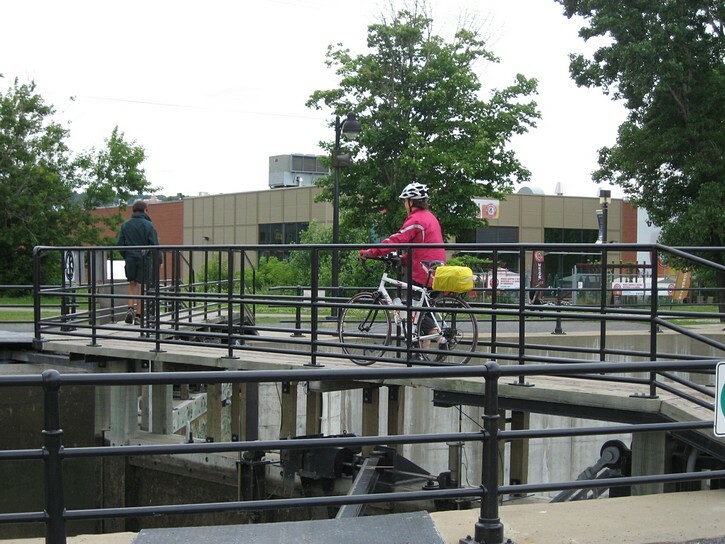 Ottawa cyclists will find that part of the Lachine Canal remind them of the Rideau Canal. The path along the canal has an excellent paved surface, no hills, and, with the exception of a few short sections, it is quite wide. In some places it is even divided into separate paths for pedestrians and cyclists. The main path sometimes jumps from one side of the canal to other, but it is well indicated and easy to follow. Before heading out, you should be warned that parts of the path (especially towards the west) can become very crowded with all sorts of users on weekends when the weather is nice. If you go for a ride during these periods, be prepared to cycle slowly at certain points along the canal. 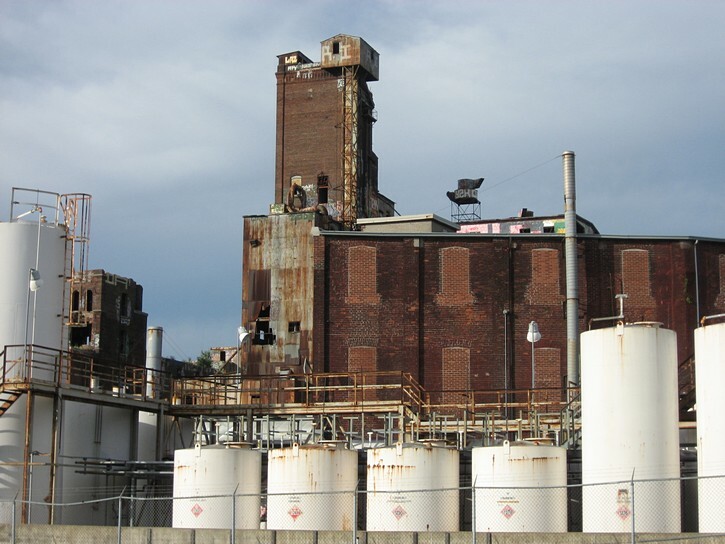 The urban landscape along the canal is varied and very interesting. 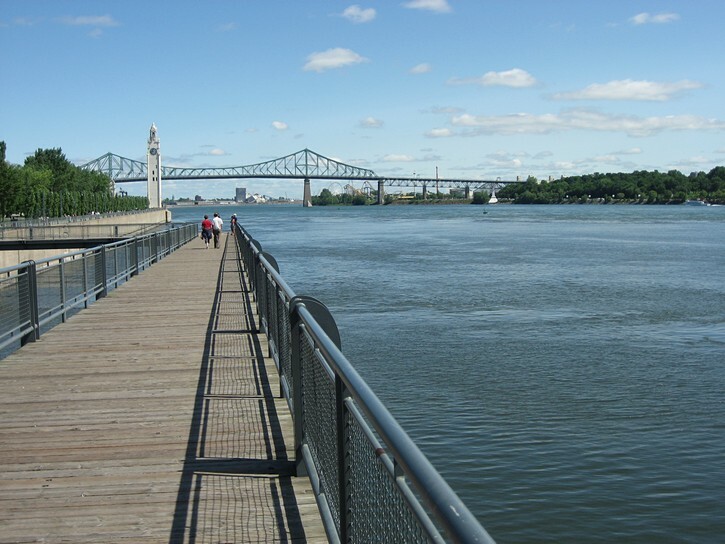 At times you will find yourself cycling in nicely appointed parks, through vibrant inner city communities, along the open waters of Lac Saint-Louis, under massive highway exchanges, and next to the vestiges of Montreal’s industrial past. In most areas you will never be far from convenience stores or snack bars, and the path is serviced by several public washrooms. The western end of the path runs in front of several goods restaurants with outdoor terraces, and there’s even a spot along the canal where a sizable brewery has set up a patio to cater to cyclists. 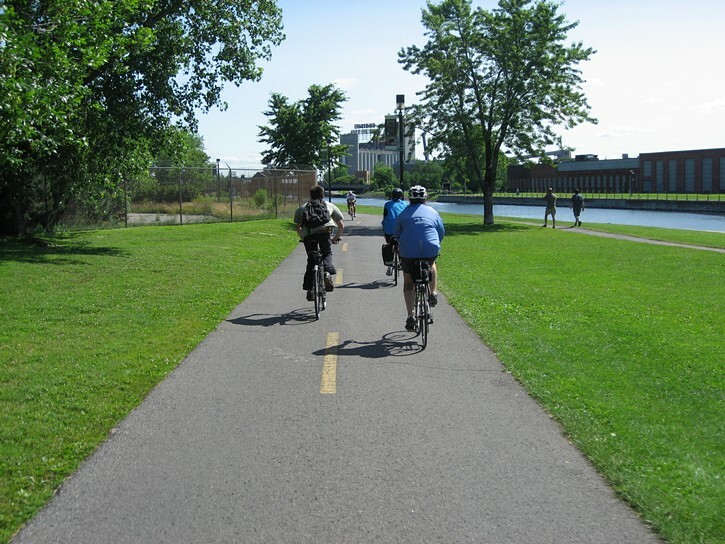 Depending on your starting point, and exactly where you plan to turn around, your ride along the Lachine Canal (there and back) will probably be between 30 and 40 kilometres. 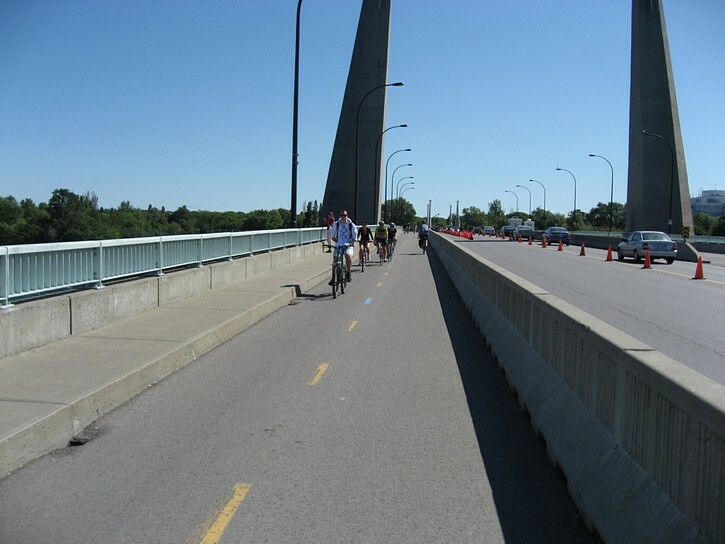 If you also decide to cycle the southern loop along the St. Lawrence River, and take a short side trip to Montreal’s Old Port (as suggested in this article), your ride may be a touch over 50 kilometres in length. 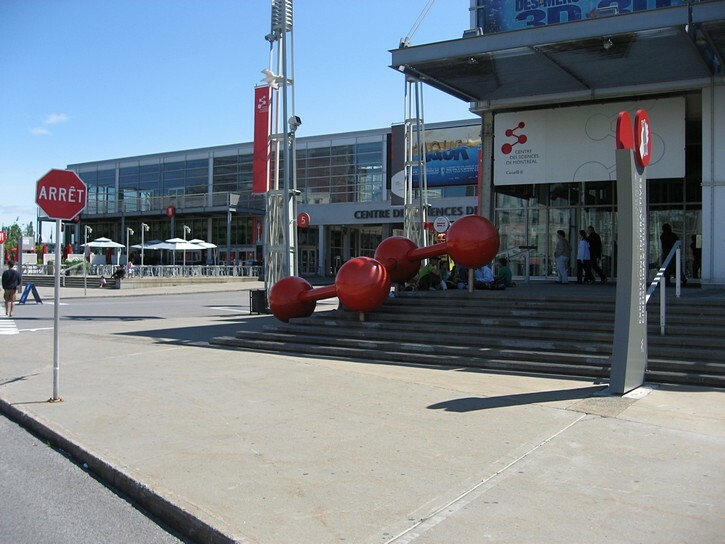 There are many access points to get on the path towards its west end, and you can find them by simply going to the waterfront of what used to be the municipality of Lachine (now a borough of Montreal). 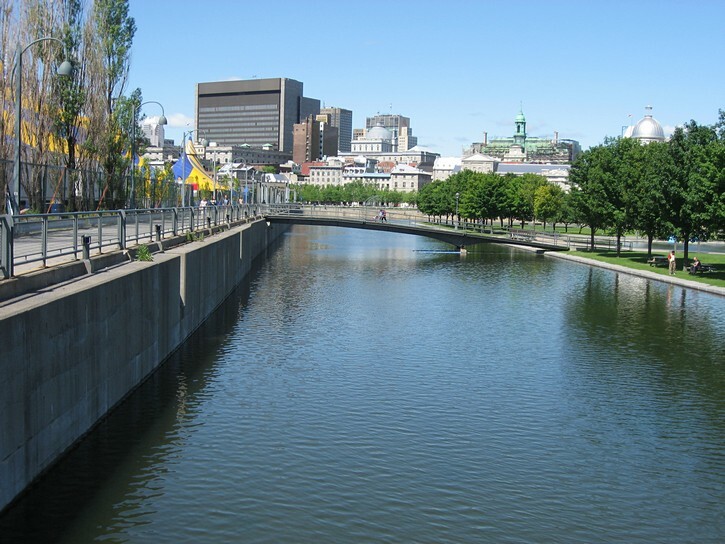 It is also easy to get to the canal from Montreal’s downtown core, although the route for doing so may not be immediately obvious. Basically you head down one major road from the city’s centre (in a southeast direction) until you hit the canal. Peel Street or Guy Street would be good choices. If you use Guy Street, you’ll have to turn right and take a small detour onto Richmond Street about block before the canal (if you use your sense of direction, you find the canal without any trouble whatsoever). Note that you’ll be going down a bit of a hill on these streets. This means you’ll have to do a little climbing on the way back, but this will be the only hill you’ll encounter during the entire ride. When you arrive at the canal from the downtown area, you’ll have the choice of turning right or left. If you head east, you’ll only ride 4 or 5 kilometres to get to what is officially known as the “Quays of the Old Port of Montreal”. It is best to stay on the path on the north side of canal when cycling in this direction. You soon pass under a few overpasses, including one for the six lane Bonaventure expressway, but it won’t be long before the path automatically leads you to the old port. This area used to be a working port, but it was transformed into a large public space in the early 1990s. There is plenty of place for walking, roller-blading, cycling, and just hanging out. Needless to say, there’s also a lot to see and do here. In addition to the usual assortment of restaurants, bars, and boutiques, you’ll find a museum, a science centre, an IMAX theater, and even the Cirque du Soleil. 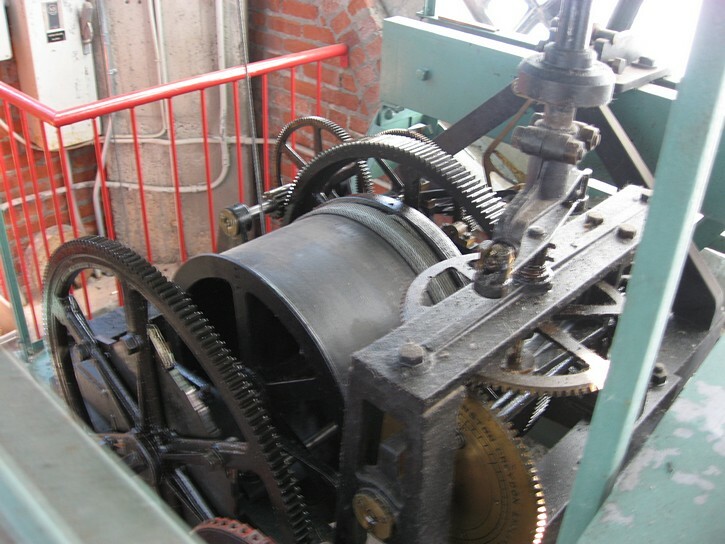 You may want to make your way over to the 45 metre-high Clock Tower on the furthest quay, and climb close to 200 steps to get a great view of the St-Lawrence River. Next to the tower is an urban beach. 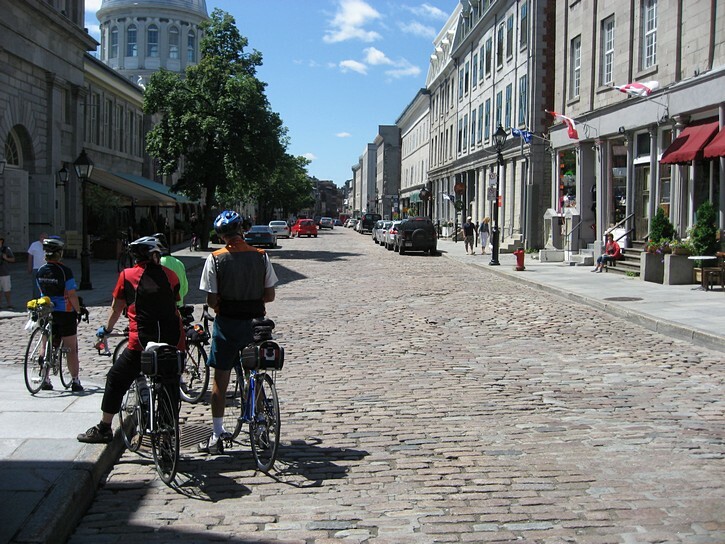 Another reason for cycling to this area is that ‘Old Montreal’ is located about two blocks north of the Old Port. If you have never been there, Old Montreal is definitely worth a visit. Some of its buildings date back to the 1600s, and its narrow streets and architecture are reminiscent of European towns in Brittany, France. 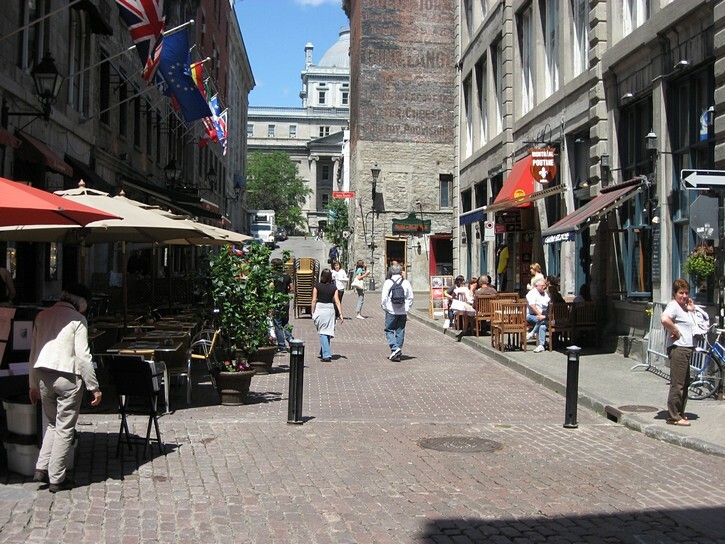 Old Montreal has its share of heritage buildings and historic plaques, and it is a popular tourist spot that’s packed with restaurants, bars, terraces, and boutiques. 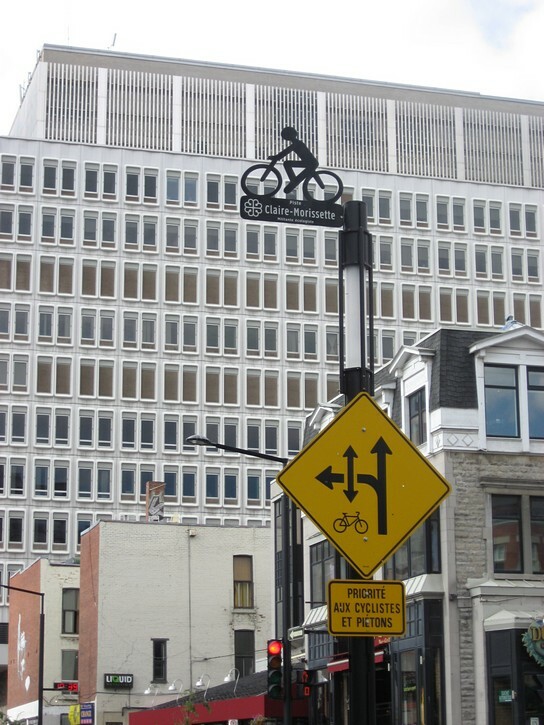 If you do head into Old Montreal, you may want to walk your bike. While not impossible, cycling on its cobblestone streets can be difficult with narrow road tires. 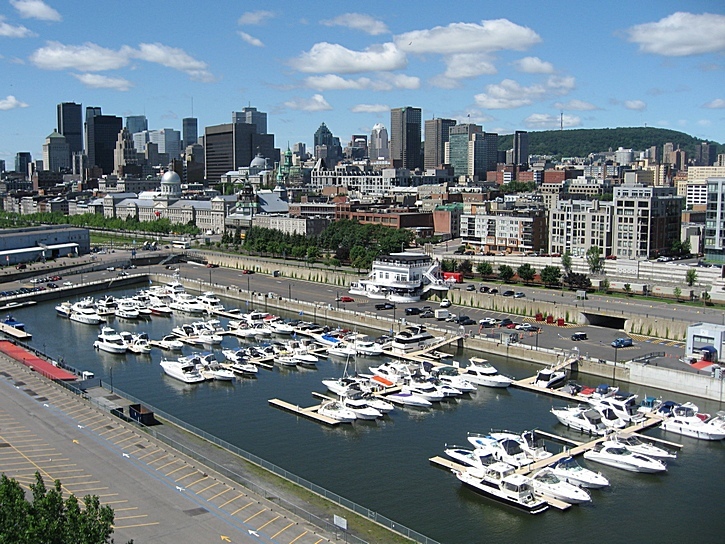 Although a trip to the Old Port and Old Montreal is a worthwhile detour, the bulk of your ride along the Lachine Canal will be towards the west. 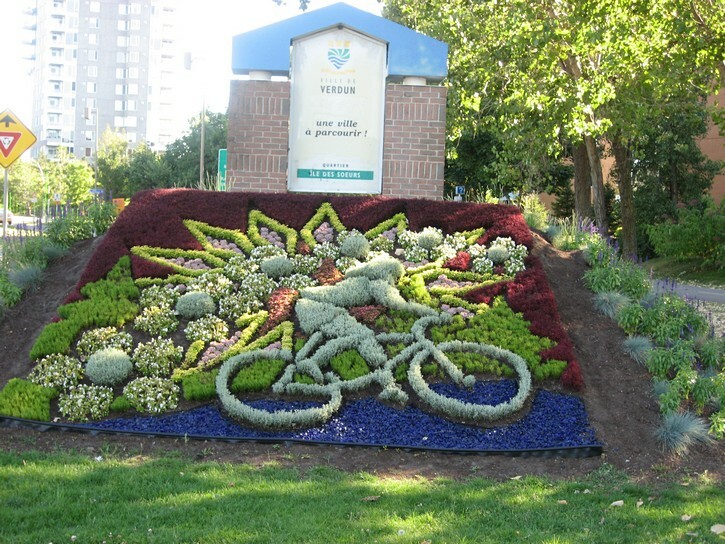 Initially, you will be riding through inner city neighbourhoods where the path can become quite busy in the evening hours as the locals go out to do a little roller blading or cycling. 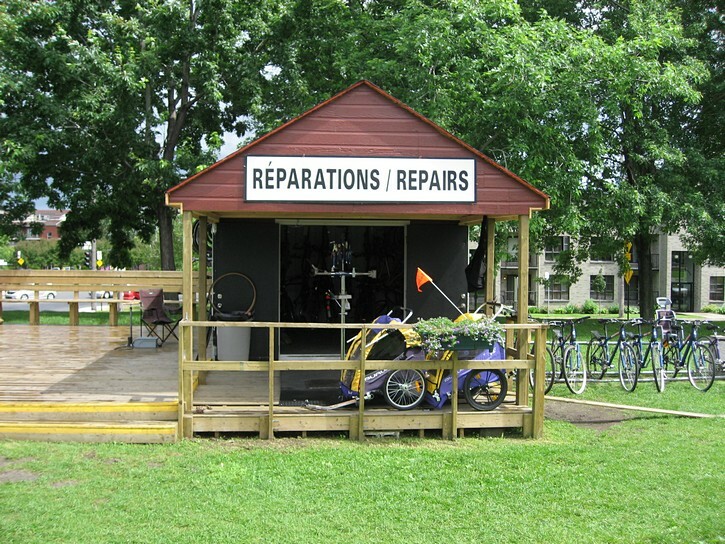 You’ll pass by a bicycle repair station and a place that rents bikes (near Atwater Avenue). This is where more and more trendy condos are being built next to the canal, but it won’t be long before your are riding through some old industrial areas. Shortly before the canal passes under a massive six lane highway, keep an eye out on the right side for a patio that has been set up next to the bicycle path behind a rather large warehouse-type structure. 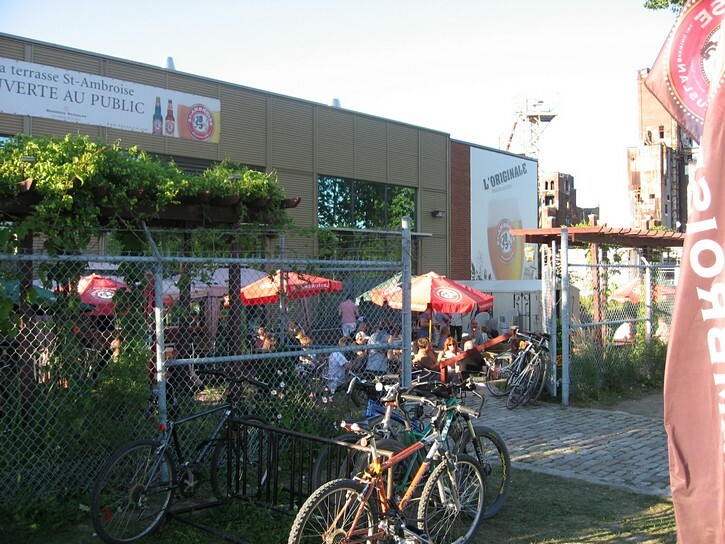 This medium size brewery produces the very popular St-Ambroise Beer, and it just happens to back onto the Lachine Canal bicycle path. They have improvised an outdoor terrace at the back of their building, complete with “deluxe” outhouses, to cater to the users of the path. Here you can get some very fresh beer, nachos, hot dogs, and other snack foods. The place seems to be especially popular with bicycle commuters who stop for nice cold beer on their way home after work on hot summer days. For the next six or seven kilometres you will be riding on a relatively thin strip of park land which runs along the canal. Just beyond this park land you will generally see highways and a variety of industrial facilities, including warehouses, plants, railroad tacks, storage containers, and so on. After the path passes under the six lane highway which leads to the Mercier Bridge, you’ll notice a residential area on your left, and you’ll soon come to the end of that part of the Lachine Canal which currently services recreational boats. At this point you’ll be at a crossroads in your ride along the canal. In front will be the René Lévesque Park which extends into Lac Saint-Louis, on your left will be a road that leads to a bike path that loops to the south and follows the St-Lawrence River, to your right will be the last of the locks on the Lachine Canal, and behind you will be a building which houses a tourist information office. If you haven’t already done so, the tourist office is a good place to pick up a free map showing the various bike paths in the area. 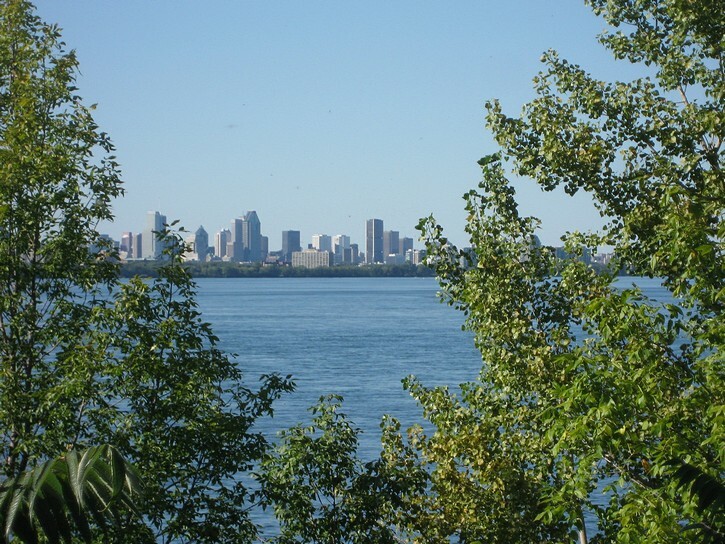 Continue straight ahead and you’ll enter René Lévesque Park which is located on a narrow piece of land which projects almost two kilometres into Lac Saint-Louis (a dead end). 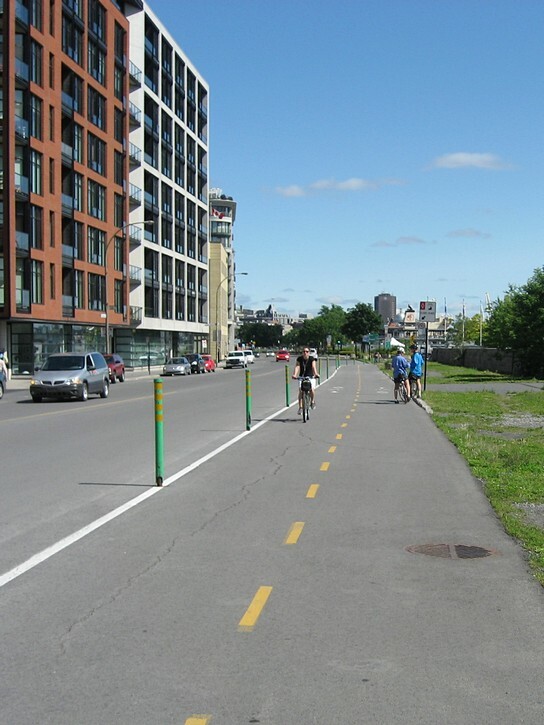 Many Montreal cyclists who ride along the Lachine Canal use this as their turn around point. They go to the end of the park where there are benches to take a break and enjoy a relaxing view of the lake. There are also public washrooms in this area. However, rather than head into the park, you may want to cycle that last four kilometres of the pathway. To do so, cross the small bridge over the lock to get to the north side of the canal. 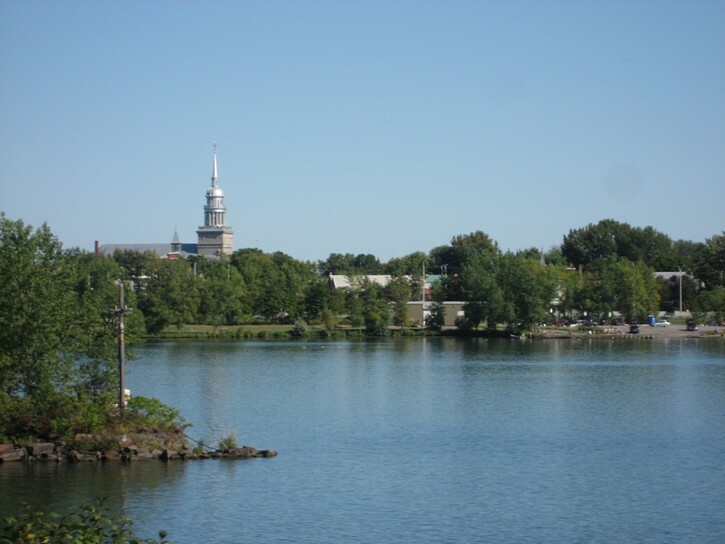 As you continue to head west, you will now be riding along Lac Saint-Louis waterfront in what used to be the municipality of Lachine (and still known as Lachine). 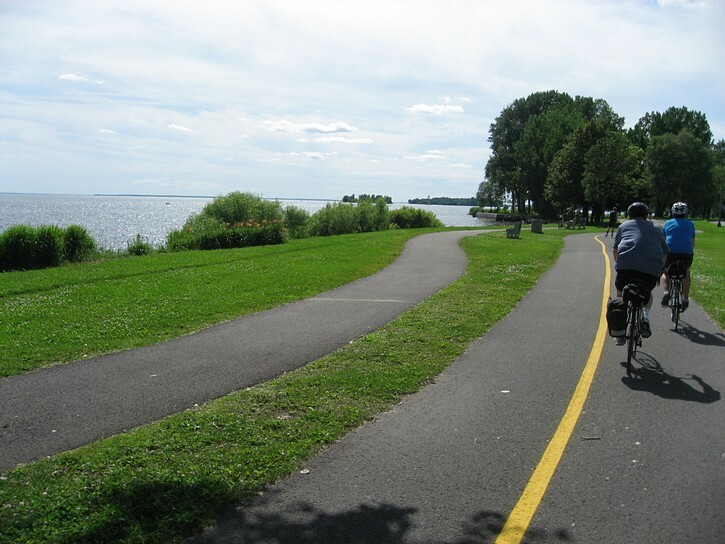 Initially, you’ll be cycling through an old section of Lachine, and for a short distance the bicycle path runs next to remnants of a much earlier version of the Lachine Canal. This area is quite picturesque, and for one or two blocks, you get the impression that you’re riding along a canal somewhere in Europe. 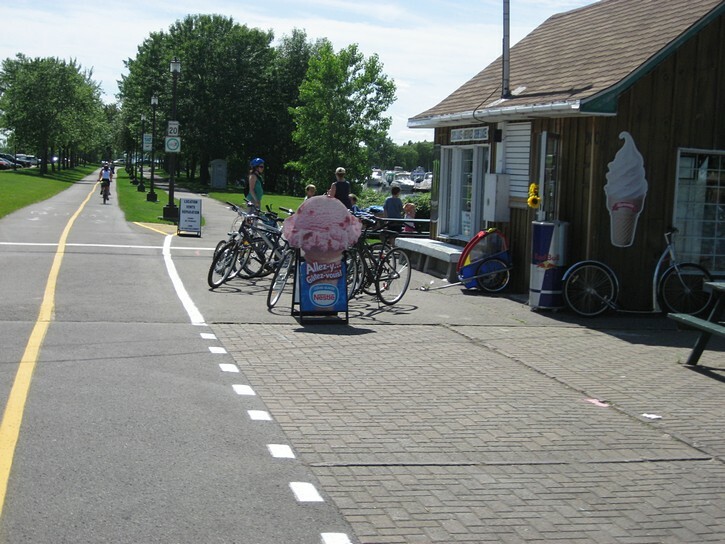 The rest of the ride along the path in Lachine is little more plain, but it passes by several restaurants, convenience store, terraces, and even a bicycle shop. The bike path runs through several waterfront parks, and it sometimes zig-zags a bit, although it is fairly easy to follow. At one point it brings you onto a sidewalk for a few hundred feet. 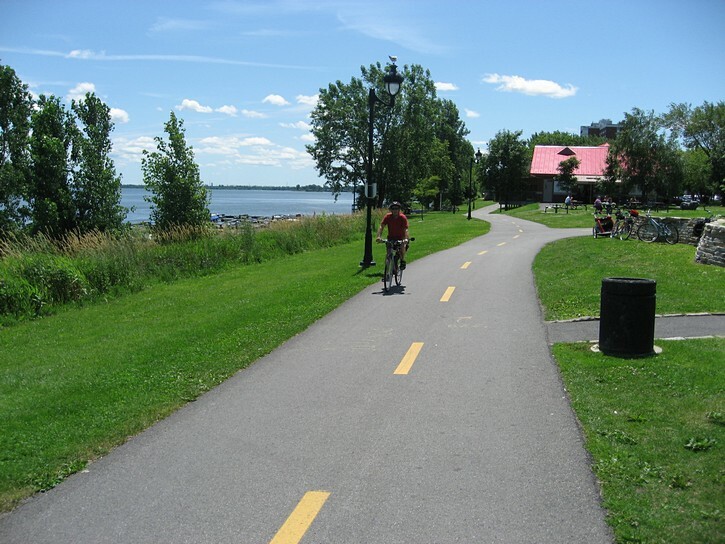 The Lachine waterfront is one of the areas where the bike path can become especially busy on nice weekends. You’ll know that you’ve come to the end of the Lachine Canal bike path when it unceremoniously dumps you onto St Joseph Boulevard. There’s a bicycle lane on this road for a couple of kilometres, and you can use it to head further west. If you follow the roads which hug the Lac Saint-Louis waterfront, it’s another 15 km to the western tip of the Island of Montreal at Sainte-Anne-de-Bellevue. 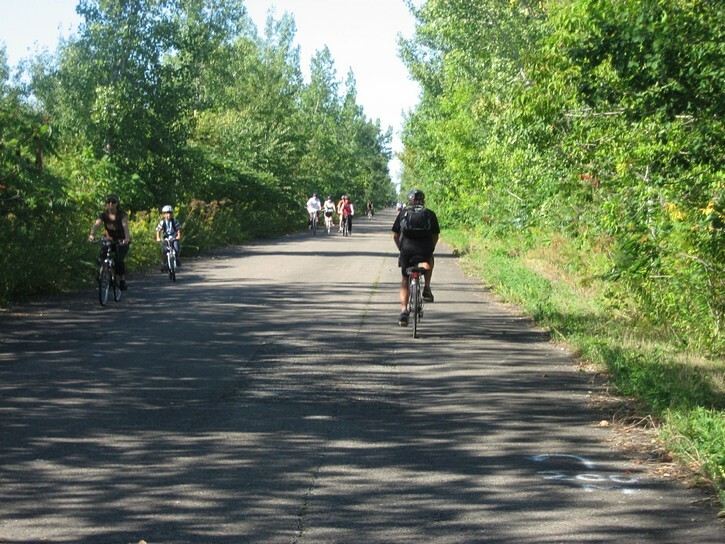 Note that while this route is popular with many cyclists, much of it does not have any bicycle lane or paved shoulder. These roads only have slow moving traffic, but they can be quite busy during rush hour. 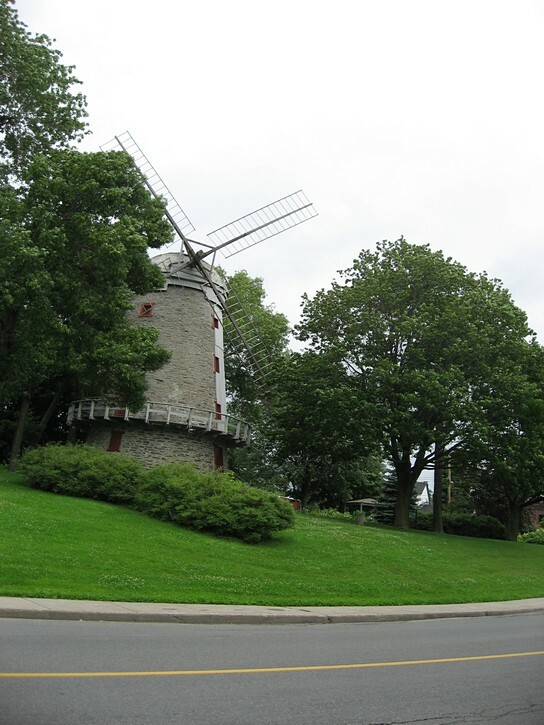 When you turn around and start to head east, you will once again arrive at the spot where the Lachine Canal bicycle path passes by the René Lévesque Park. Here you have to make a decision on the exact route you’ll take to get back to downtown Montreal. Obviously, you can follow the canal and retrace your route to where you started. Another option is to take a southern loop that runs along the St-Lawrence River (not to be confused with the south shore, which is on the opposite side of the river). 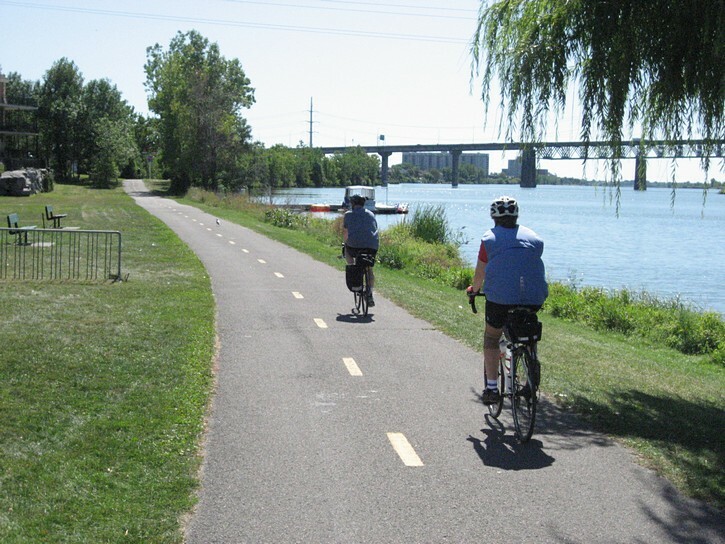 Here you will be riding on an excellent bike path for almost the entire route. However, before heading off in this direction, you may want to have a map showing bicycle paths in the area. Following the bike path is a no-brainer for the first 90% of this route. Unfortunately, at the end, there’s a one kilometre gap where you could get lost without a map. To get to this route along the St-Lawrence River, head south on Chemin De Lasalle. 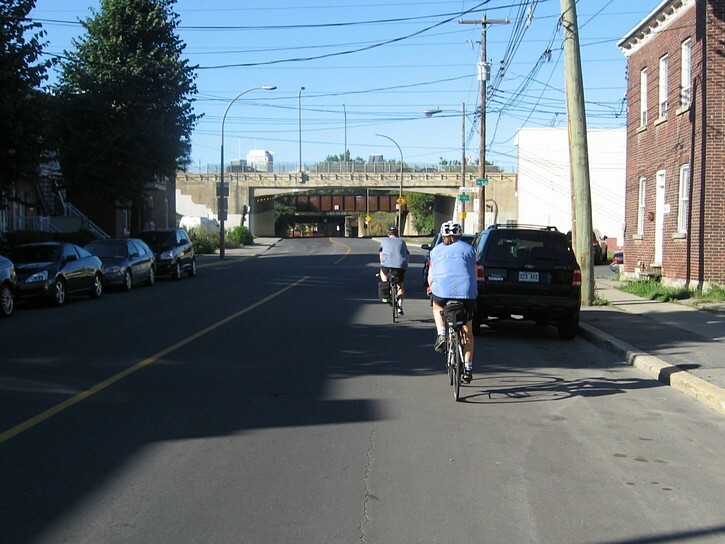 In a few hundred metres you’ll find the bicycle path which parallels Boulevard Lasalle. From here you’ll be cycling in a easterly direction. This path generally runs through a very narrow strip of park land, and for most of your ride you will have an unobstructed view of the river. 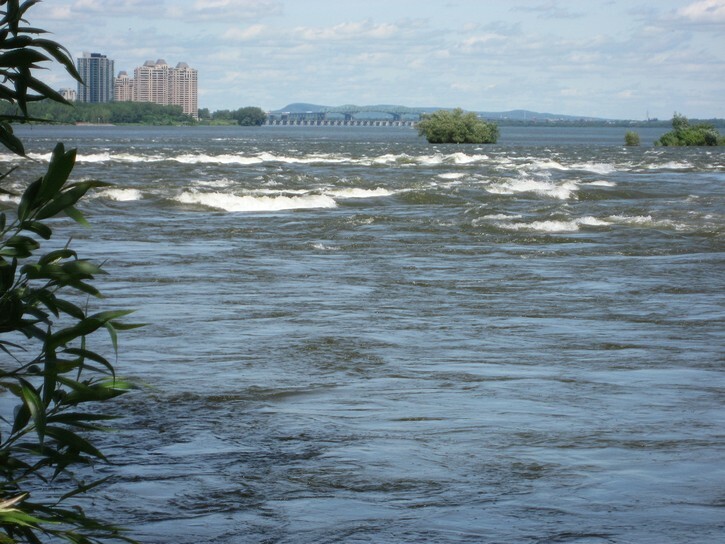 At about the half way point along this path, the strip of park land becomes wider, and here you will come across several spots where there good views of the Lachine Rapids (and the reason why the Lachine Canal was built). In the distance, on the other side of the river, you will see the St. Lawrence Seaway. When looking at a map of the bicycle routes for this part of Montreal, you’ll notice that there’s another bike path in the area, which follows the Canal de l’Aqueduc. Although the path itself is okay, this route is not overly interesting, and is not on par with what exits along the Lachine Canal. As you cycle towards the end of the southern loop, you’ll be in Verdun. It is now a borough of Montreal, but at one time it was a separate city. 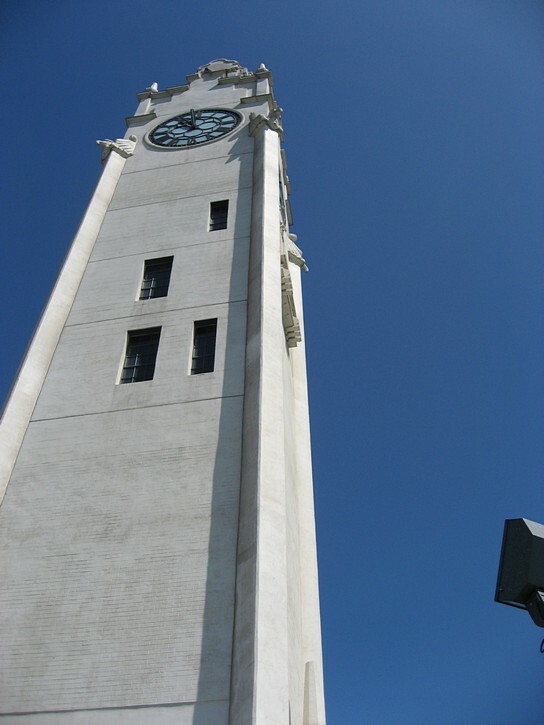 Wellington is Verdun’s main commercial street, and it is located about one block inland from the waterfront. Here you will find restaurants, stores and shops. As you continue to cycle along the river, the path will eventually pass by several sports fields, and it will veer inland and come to an end. This is the gap where you might get lost without a map. 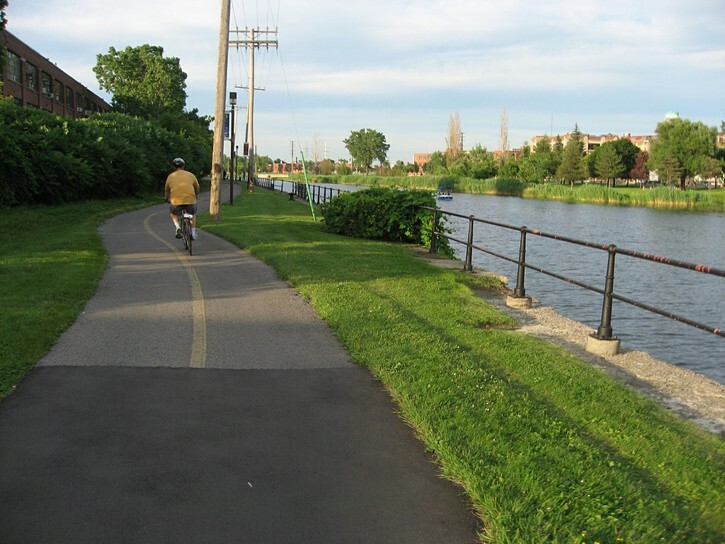 Basically, you want to cycle in a northwest direction for a little over kilometre until you reach the Lachine Canal. Do so by taking Rue Henri Duhamel, turning right on Boulevard Lasalle, passing under a major expressway, and then following Rue d’Argenson and Rue St-Charles. Note that you will be riding part of the way on a bicycle lane that is well demarcated, and then on some quiet streets where the bike route is very well indicated. In other words, it is not all that difficult to figure out your way back to the Lachine Canal, but it’s a good idea to have a map in your back pocket as a precaution. 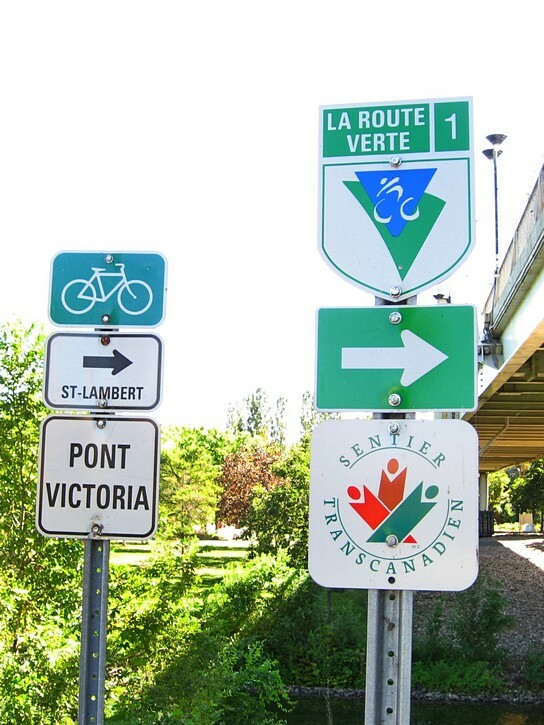 Once you have reached the Lachine Canal, you can turn right for a relative short ride back to downtown Montreal. 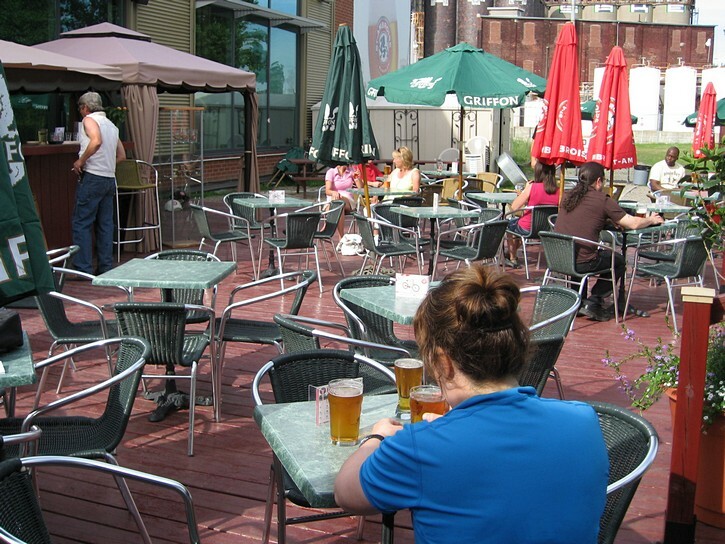 Alternatively, you can go left for about a kilometre to stop at the brewery that has set up a terrace to service the needs of people like you – who have just completed a great ride along the Lachine Canal. You’re in Montreal for another day. 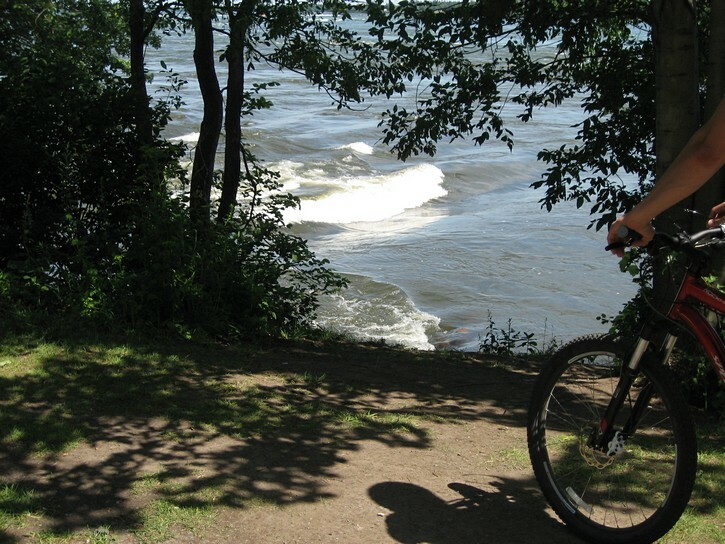 You rode the Lachine Canal yesterday, and you are ready for more. Maybe you should consider heading over to the “South Shore” of the St. Lawrence River. 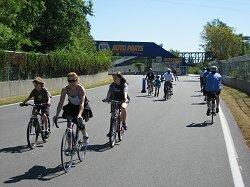 With this route, you will leave the Island of Montreal, get a close-up look at two locks on the St. Lawrence Seaway, cycle on islands that were home to the Expo 67 World’s Fair, ride on a real honest-to-goodness Formula One race track, bike on a narrow strip of land smack in the middle of the St. Lawrence River, and pedal back to Montreal on an “ice bridge”. This ride takes place over flat terrain, and depending on your exact departure point in downtown Montreal, it will probably be 40 to 50 kilometres long. You start this ride in the same way as yesterday by heading down to the Lachine Canal, and then turning left to go in an easterly direction. Instead of using the path on the north side of the canal, as is the case when heading to the Old Port area, you want to stay on the south side of the canal. As you cross under the six lane Bonaventure Expressway, the path veers to right and actually parallels this elevated highway for a short distance. Here you will truly be cycling in a concrete jungle. 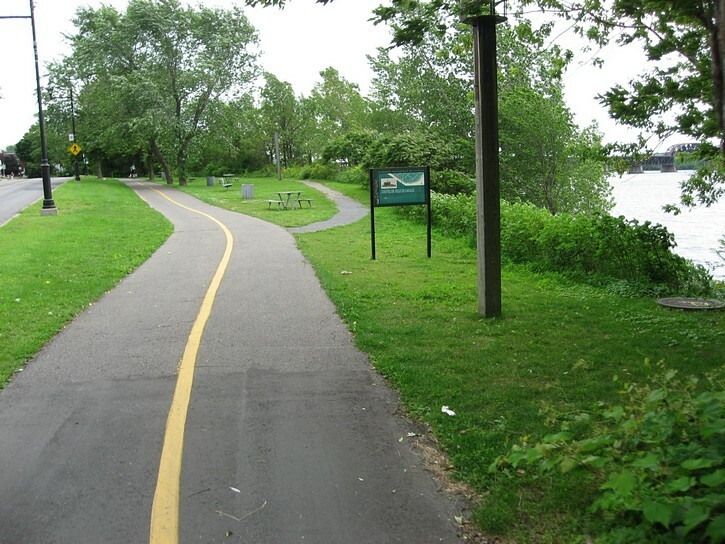 Before long the path turns to the left and you will be riding on a narrow peninsula that jets out into the Montréal Harbour. 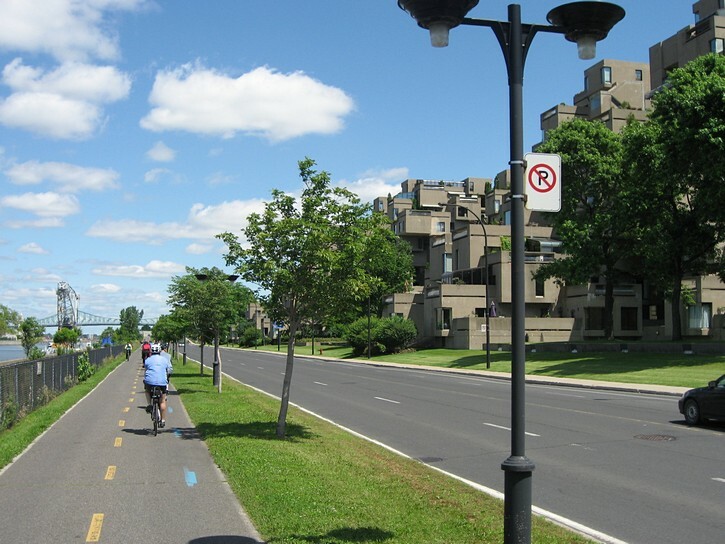 On your left will be great view of the Old Port area, and on the right you will pass in front of Habitat 67. 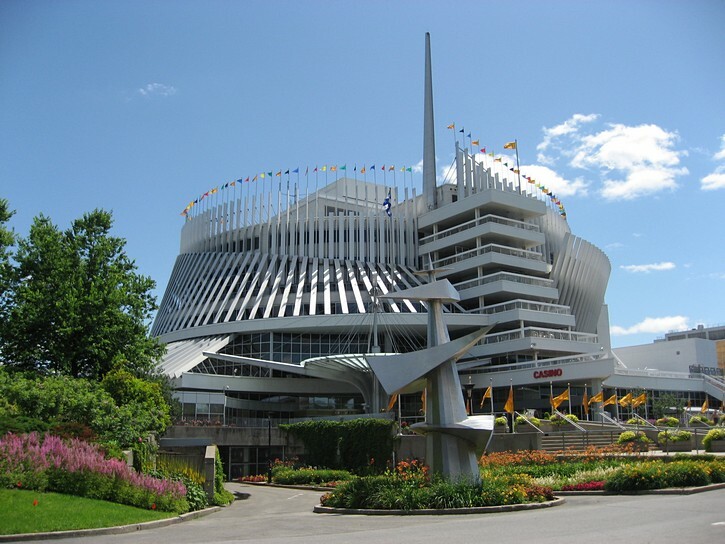 This structure was built as part of the World’s Fair to demonstrate a new concept for providing people with homes in a multi story building. It’s an innovative structure and over 40 years later the ideas behind Habitat 67 still seem to be avant-garde. The path will now lead you to a bridge which crosses the tip of Sainte-Hélène Island and deposit you on Notre Dame Island. The bicycle lane exits on a U-shaped ramp, at the bottom of which you’ll find public washroom facilities. At this point you’ll be in the heart of what used to be the Expo 67 World’s Fair. This event generated a great deal of excitement and national pride during Canada’s centennial year, and it remains one of the most successful World’s Fairs with over 50 million visitors. 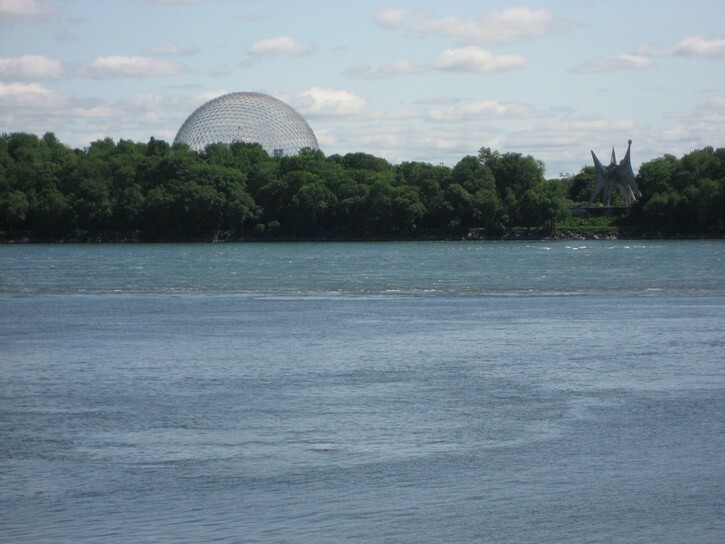 A number of the pavilions from Expo 67 are still standing on Ile Notre Dame, and the old French pavilion now houses part of the Montreal Casino. 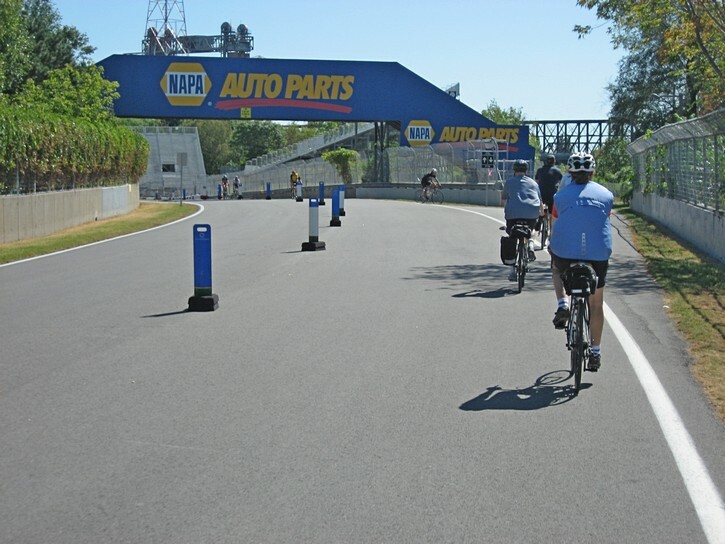 As you cycle in a southwest direction, the path crosses the Gilles Villeneuve Formula One race circuit, and soon afterwards, you’ll actually ride on it for a short distance on it. People responsible for such things were kind enough to post signs explaining that this part of the bicycle path will be closed when a Formula One race is underway. After exiting the race track, the path will lead you to the southwest tip of the Island. 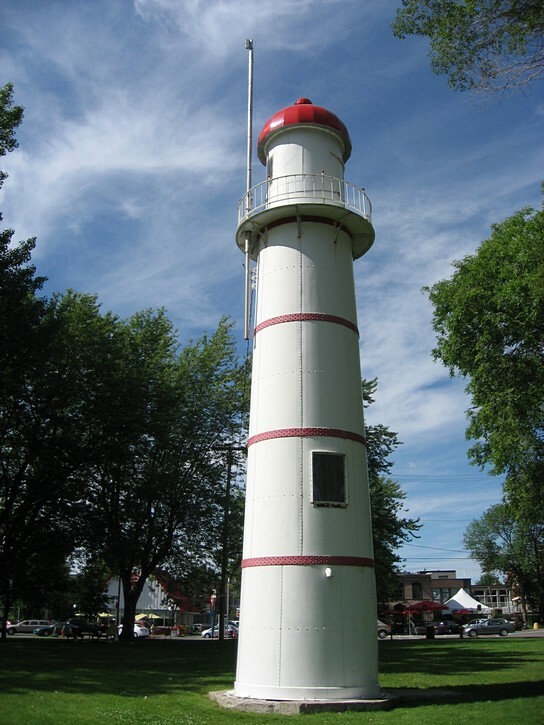 It is connected to a long narrow piece of land which runs down the middle of the St. Lawrence River, and which forms the northern edge of the Seaway Canal. If you wanted to, you could start cycling down this strip of land. This part of the path has a hard packed crushed stone surface, and it is easy to ride even with narrow road tires. However, to complete your journey to the “South Shore”, you’ll have to back track a few dozen metres to the Victoria Bridge. It is necessary to cross the Victoria Bridge to get to the South Shore. It is a lift bridge, so if you happen to arrive when a ship is going through the lock in this part of the Seaway, you may have to wait 15 or 20 minutes for it to pass. On a nice day you could be in the company of a couple dozen cyclists doing the same thing. This would be a perfect time to take a rest, drink some refreshments, and strike up a conversation with fellow cyclists. It is worth noting that outhouse toilet facilities have been installed in the vicinity for the convenience of those people who may be waiting to cross the Victoria Bridge. Once on the South Shore, you basically ride along the St. Lawrence River in a southwest to west direction for about 20 kilometres. You’ll be cycling on good quality paths or on bike lanes that are well demarcated. 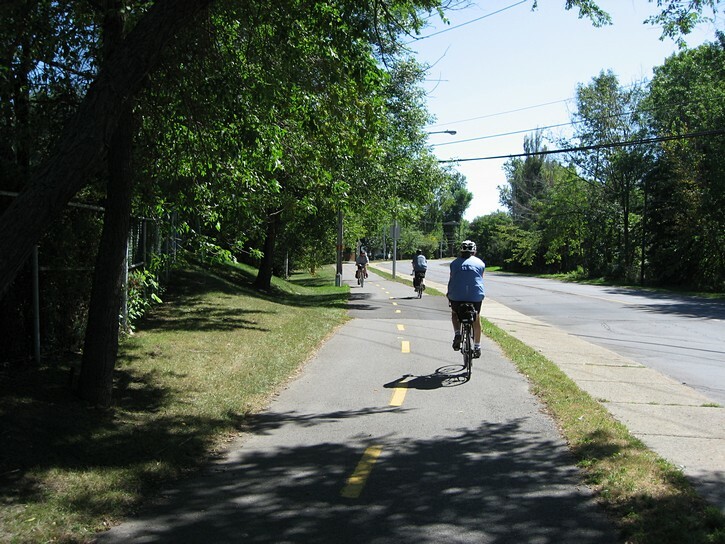 In a few area around Brossard and La Prairie, the path will bring you inland for a short distance. Stay on the path and follow the signs and you should not have any problems with this route. It should also be mentioned that although this part of the ride is pleasant enough, there is nothing especially exciting about the South Shore. As is typical of many suburban areas, it has its share of sub-divisions, shopping centres, and highways. You will be getting close to the western end of your ride on the South Shore once you pass Candiac. 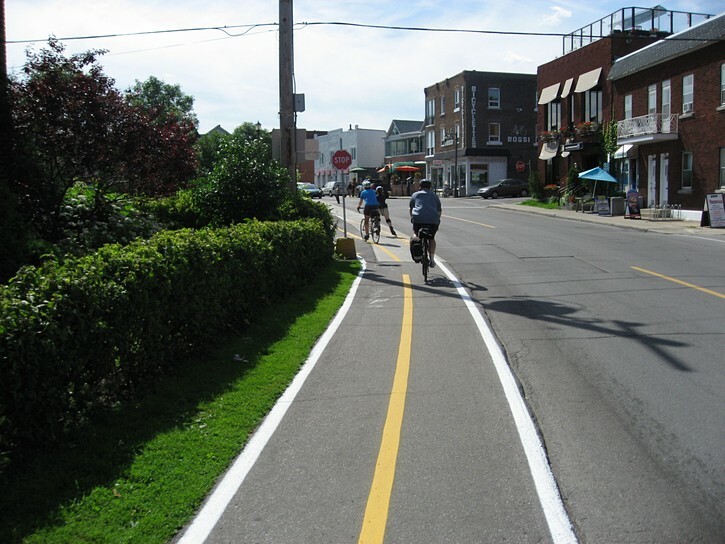 Here you should be cycling on the path next to Boulevard Marie-Victorin. There are a couple of restaurants and convenience stores in this area, and you wish to consider getting a bite to eat or something to drink because this will be the last chance to do so until you get back to Montreal. 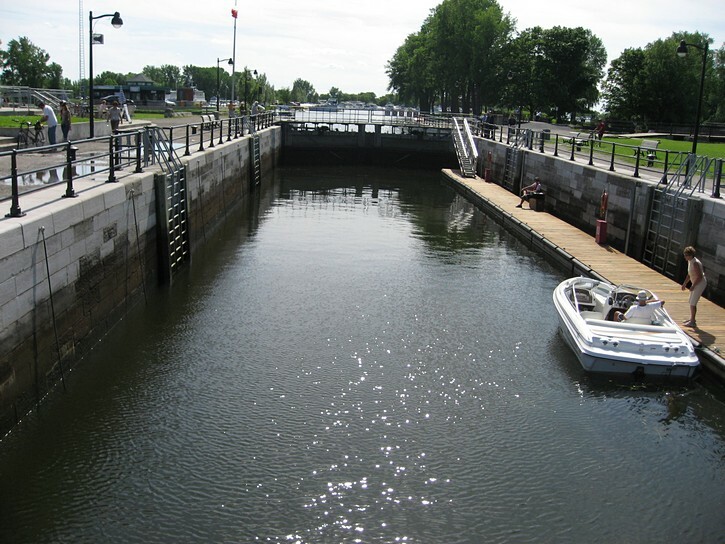 In a few kilometres you’ll have to turn right and cross a short bridge that leads to the Côte Ste-Catherine Lock on the St. Lawrence Seaway. There’s a stop sign on Boulevard Marie-Victorin at this point, and signs indicating the turn off for the seaway lock and a waterfront park. To get to the other side of the lock, it is necessary to cross a small draw bridge. Again, this could mean a 10 to 15 minute wait if you happen to get there just as a ship is passing through. Once on the other side, turn right and start pedaling. You will be cycling in an easterly direction on the thin strip of land in the middle if the St. Lawrence River for a little over 10 kilometres. This is a very relaxing ride that takes place on a nice wide path that has a paved surface for most its length. The only problem is that at certain times of the year the middle of the river seems to be home to the occasional swarm of tiny airborne bugs. Keep your mouth shut when you encounter these. This path on the narrow strip of land leads all the way back to Notre Dame Island, and the spot where you crossed the Victoria Bridge. However, you don’t want to go this far. Instead, you’ll want to take the turnoff for the “ice bridge” to get back to Montreal. The place to turn is well indicated. 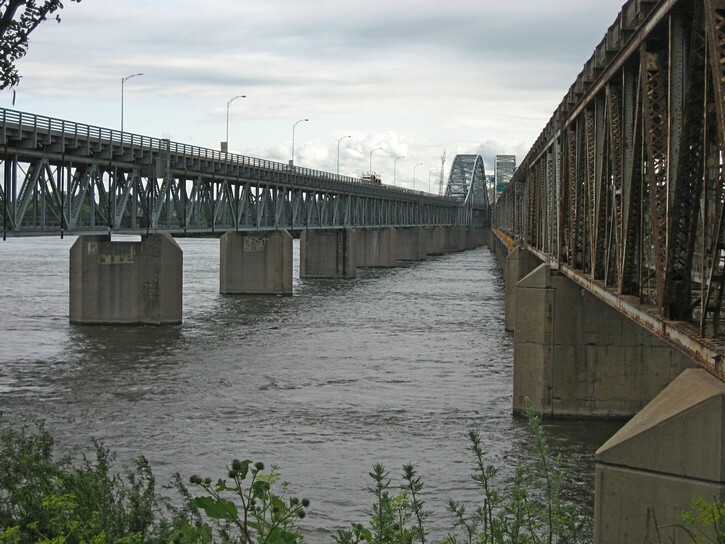 It is located a couple of hundred metres before the Champlain Bridge, which passes high above the path (a major link for motorized traffic between Montréal and the South Shore). You will now cycle two kilometres across the ice bridge to Montreal. It’s not really accurate to call it an ice bridge. 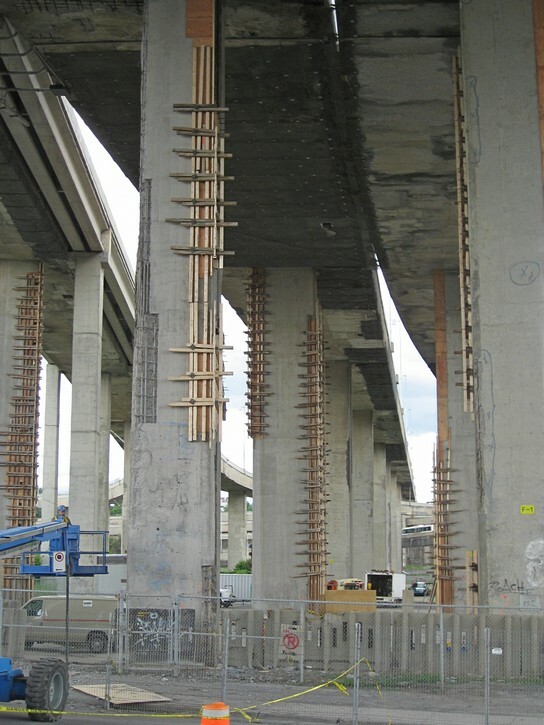 It is a concrete structure that spans a fairly wide section of the St. Lawrence River, and is designed to control the flow of ice during the winter. 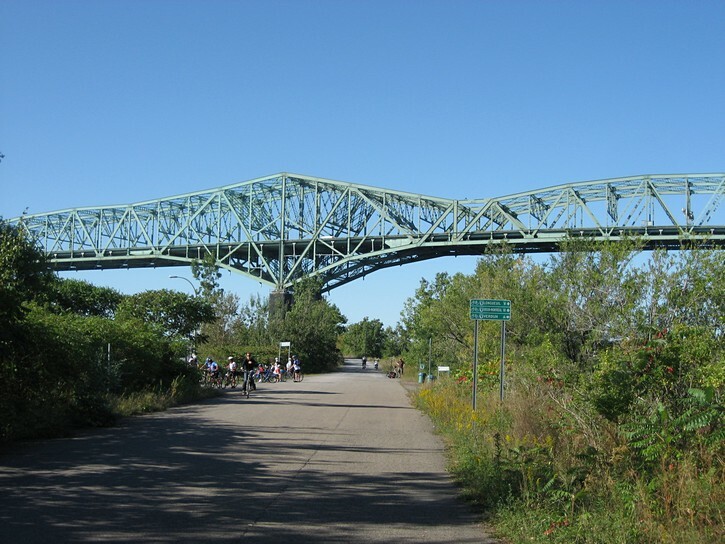 As such, it is better described as the “ice breaker bridge”, but it sounds more exotic to tell people you rode on an “ice bridge” to get back to Montreal. Regardless of what you call it, when pedaling across, you may share the sense of empowerment cyclists get knowing that they have almost the exclusive use of this bridge. The ice bridge will lead to Nun’s Island (Île des Soeurs), which is part of the Montreal borough of Verdun. You want to cut across the east part of this small island, but unfortunately, the route for doing so isn’t all that evident. Although it is signed, and follows bike lanes in a few spots, this route zig-zags through a number of streets, so it would be a good idea to consult a bicycle map. 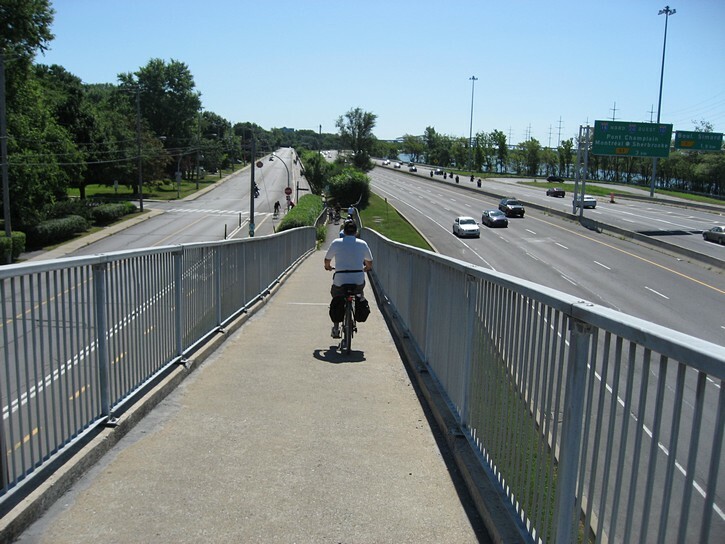 When getting off Nun’s island, you’ll end up on a relatively short bridge that has a narrow sidewalk located next to a very busy highway. 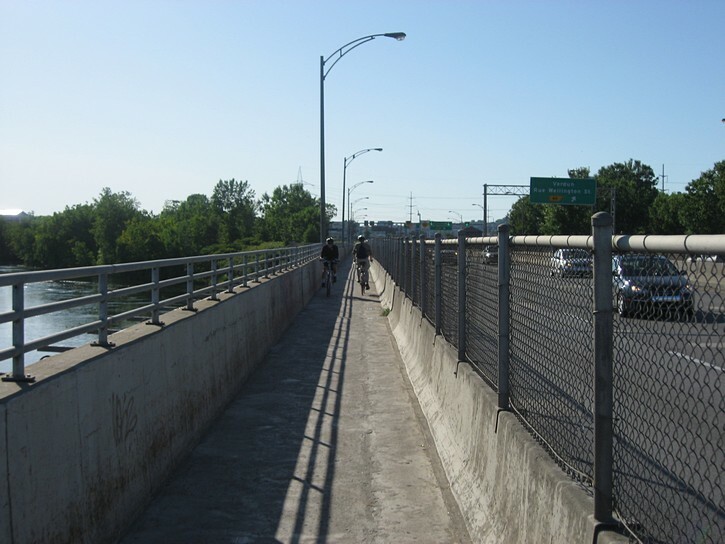 Although you will be separated from high speed traffic by a concrete barrier, the sidewalk is not wide, and you may have to pedal slowly or walk your bike, especially if you encounter someone coming in the opposite direction. Once across this unpleasant little bridge, you will soon reach the point on the path which intersects with the route you followed to complete the Lachine Canal ride. 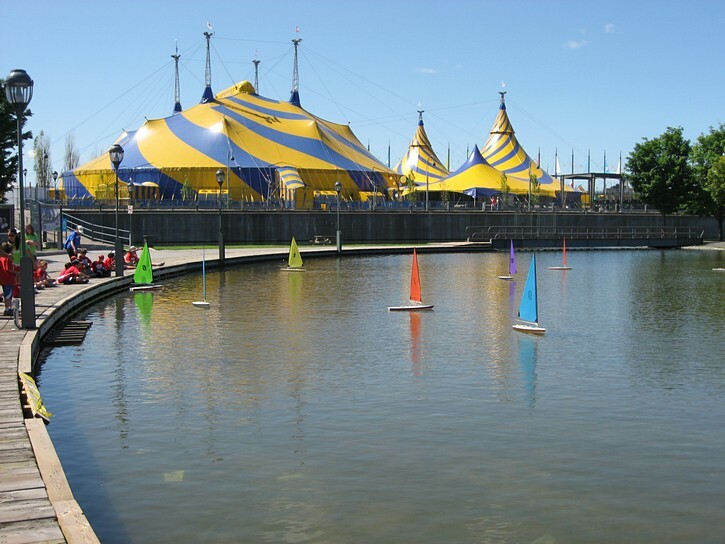 You will be in Verdun, at the place where the bicycle path which runs along the St. Lawrence waterfront comes to an end, and where there is approximately a one kilometre gap to get to the Lachine Canal. This is where it becomes necessary to zig -zag through various streets to find your way, but it should be easy to figure things out if you took this route yesterday during your Lachine Canal ride. If not, you may want to consult a bicycle map. 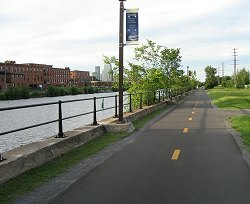 When you reach the path along the Lachine Canal, turn right to head towards downtown Montreal. And yes, you can always turn left, cycle about a kilometre, and go to that brewery for another cold beer. ► A map with showing the paths along the Lachine Canal. ► A very useful Google map with Montreal cycling routes. ► A detailed cycling maps of Montreal. 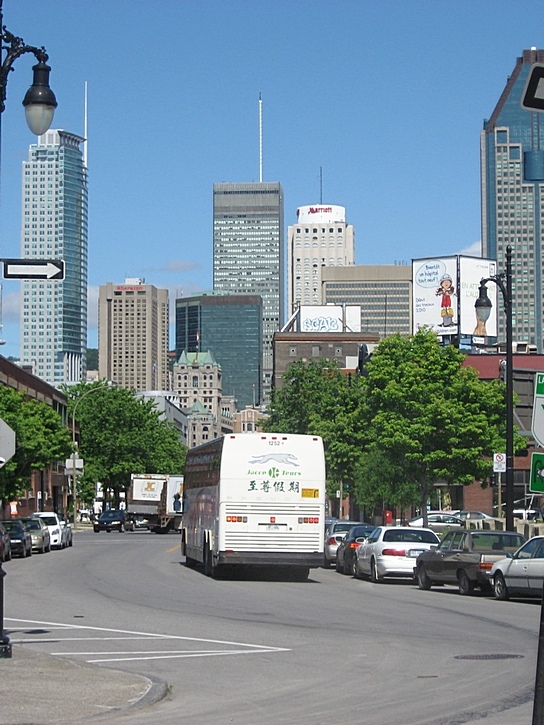 ► General Tourist Information for Montreal. ► VIA Rail Train service which accommodate bicycles.